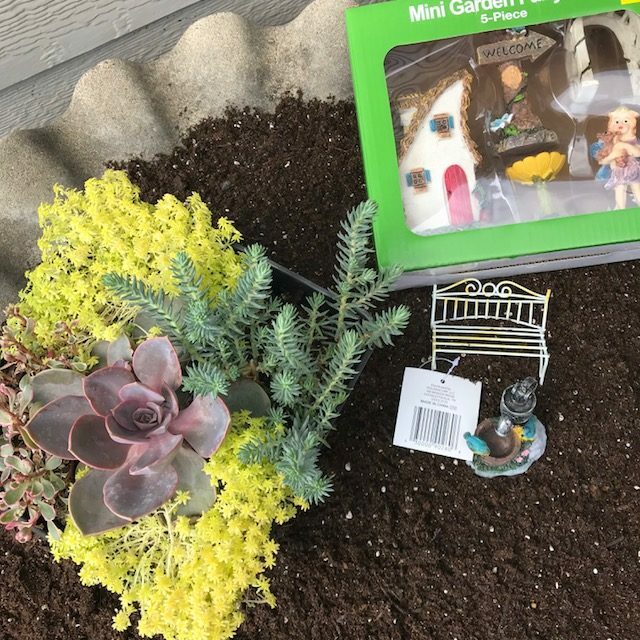 I have wanted a fairy garden since I was a little girl! There is a sense of whimsy and imagination that comes along with fairy’s that I think everyone can appreciate. You can make a fairy gardens large or small depending on your space, time and budget. 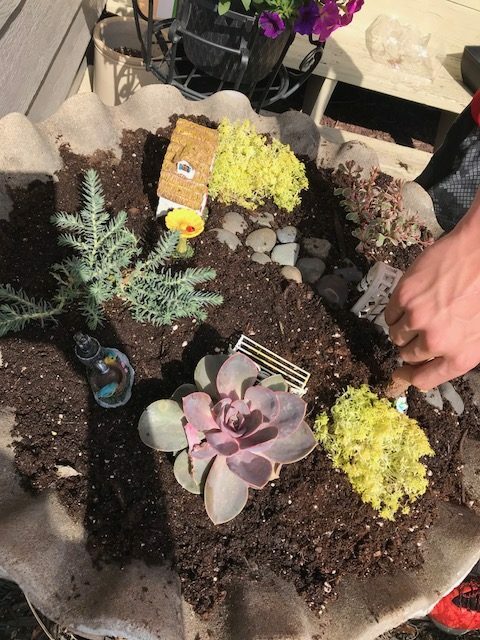 Fairy gardens are also great ways for kids to learn how to take care of plants. Let each of your kiddos create one of their own to tend to throughout the year! 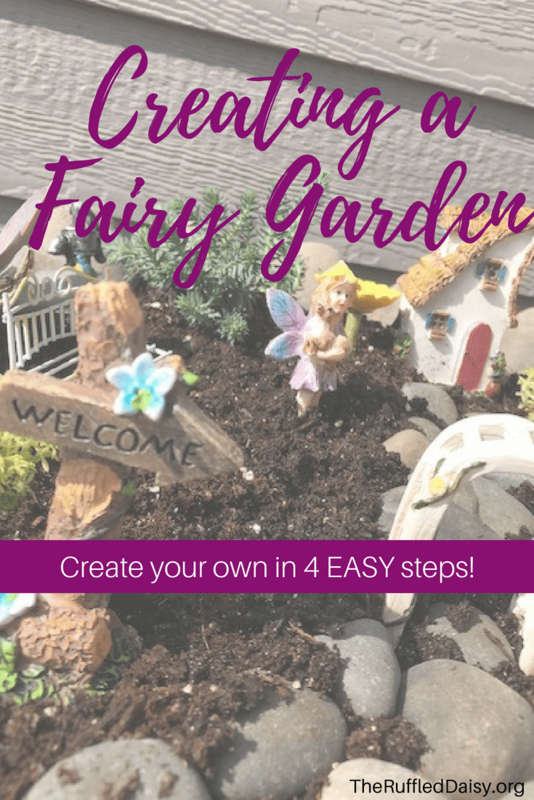 There are 4 simple steps to creating a fairy garden! Once you know what they are and have all of your supplies, you’ll have yours done in 15 minutes! Get the kids involved! My 14 year old even enjoyed this project. AND, he’s a boy 😉 I appreciated it because it was a short 15 minutes that the boys weren’t fighting. Sibling love/rivalry is a real thing. You’ll need a container, soil, plants and decorations! That’s it. Please know that this “little” project can quickly become a costly one if you enjoy it and plan to add to it. as the years go by. Picking the right container is solely dependent on your space restrictions or what you have on hand. I wanted to keep this cheap! 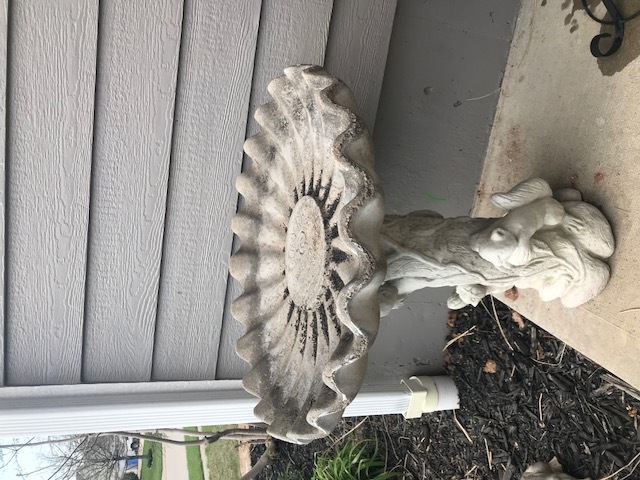 I had an old birdbath that was handed down to me from my grandmother and with our crazy lifestyle (read boys with LOTS of baseball) I was never able to keep it full of water so the birds could enjoy it. I also didn’t want to just get rid of it. Old bird baths can serve as a GREAT fairy garden! Flower Pots – check out this one that is already broken and has the fairy house attached! 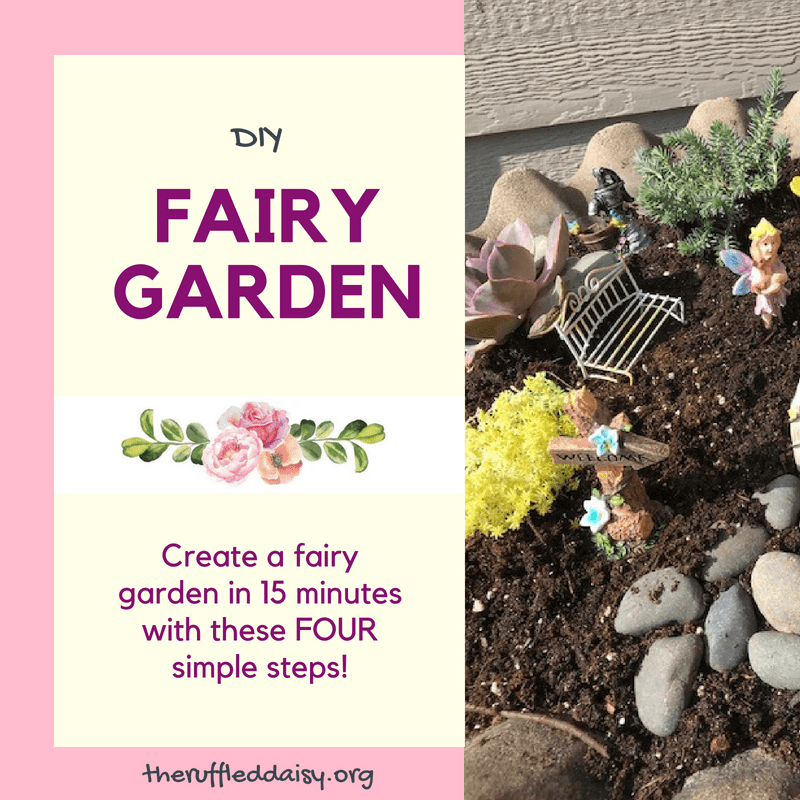 If you’re creating your fairy garden in an established flowerbed, you can skip this step! Having good soil for the plants to grow in is crucial especially when you are planting in smaller containers. They tend to dry out quicker and so you want the nutrients that are in store bought potting soil. I just used very basic potting soil for mine. You will need to research the soil for your area and the plants that you are wanting to plant to find out what is best for you. Typically anything they sell at a local nursery or hardware store is fine. This is a step that most people overlook and it can make or break your fairy garden. You want to make sure that you have plants that are suited for your area. If you are planting in a container, you’ll want to make sure that there is adequate drainage so that the plants don’t drown when you water them. This can be as easy as drilling holes into the bottom of your container. I found a succulent pack at Walmart and so I just started with that. Succulents can withstand the heat and dry soil – remember how I couldn’t keep the bird bath full of water? Same thing with watering plants 😉 I needed something that would withstand the crazy Kansas heat! This is where you get to have fun!! I purchased a SIMPLE set that was from Dollar General that included about 5 fairy garden pieces. This was the PERFECT start! We also had some river rock in another flowerbed and so we grabbed some small ones and made a path for fairies! They can’t get their toes dirty 😉 You could also use pea gravel or marbles! Check out my Amazon Influencer Page for lots of other decorations that I saved for you!! Look at how CUTE these are!! 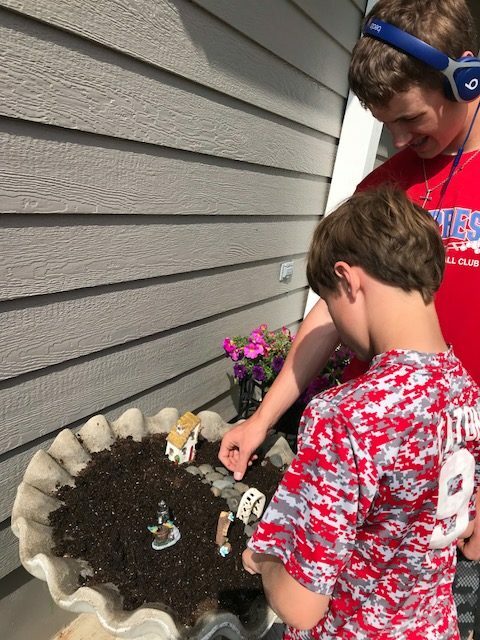 My boys had so much fun disconnecting from electronics and baseball for an afternoon of creating this fairy garden! My youngest loves taking pride in watering it (SCORE for me) since he had a hand in helping. 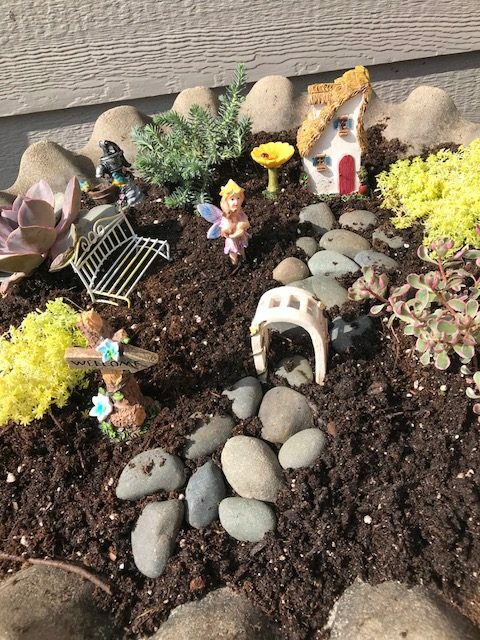 Have you created a fairy garden of your own? Are you loving the ability to add to it through the years and see the transformation that they plants take? I can’t wait to see what this looks like at the end of the summer. Host a get together and have a craft party where you all create your own! The BEST Enchilada Casserole - perfect for potlucks! This is so fun! My girls love the play outside and garden, so this would be a fun activity for my girls this spring. Cute idea…unfortunately I have dogs and horses that get into everything!